Snorkelling at Governor's Beach, Grand Turk. Governor's Beach is the best beach on Grand Turk. This beach may have the sparkliest ocean water of any coast in the country. Found on the west coast between the Cruise Center and Cockburn Town, Governor’s Beach is the best beach on Grand Turk. The site gets its name from being the location of the Governor’s mansion, Waterloo, which is found a short distance away from the main beach access. The pristine Governor's Beach, Grand Turk. Sheltered from the typical east southeast tradewinds, this beach offers a wide strip of white sand, shallow clear water, and a thick Casuarina tree grove for shade. There’s really not any good snorkeling at Governor’s Beach. Some rocky patches can be found in areas, but simply not much coral or fish life to be found here. Although typically calm, when there is a high ocean swell Governor’s Beach can experience some low rolling waves. When a cruise ship is in, there are usually vendors selling souvenirs and cold drinks. Governor's Beach is part of the Columbus Landfall National Park. If you expect to rent a vehicle and explore Grand Turk on your own (one of our top recommended activities), you may want to make Governor’s Beach your initial stop, as you’ll beat the tour crowds and will have much of the coast to yourself for an hour or two. The ocean clarity at Governor’s Beach is exquisite, and the sand is incredibly soft with a light peach hue. 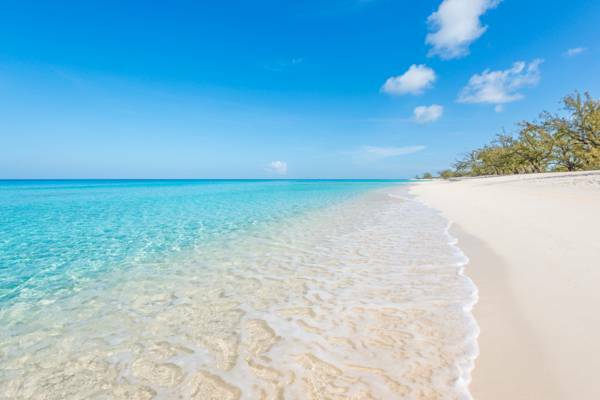 Much of the sand in the Turks and Caicos is of broken down shell and coral origin, and the fineness of the sand grain and colour are dependent on how new the sand is. The excellent sand at Governor’s Beach is quite fresh, having been produced a short distance away on the reef and dive sites off Grand Turk. If you take a snorkelling or scuba diving excursion you’ll be able to see this in live action, as parrotfish and other sea animals feed on reef algae and corals. The snorkelling at Governor's Beach. Governor’s Beach is also a popular beach snorkelling spot. However, this is mainly due to ease of access and the typically excellent underwater visibility of the beach. The only underwater sights close to shore are the remains of an ancient rock jetty. 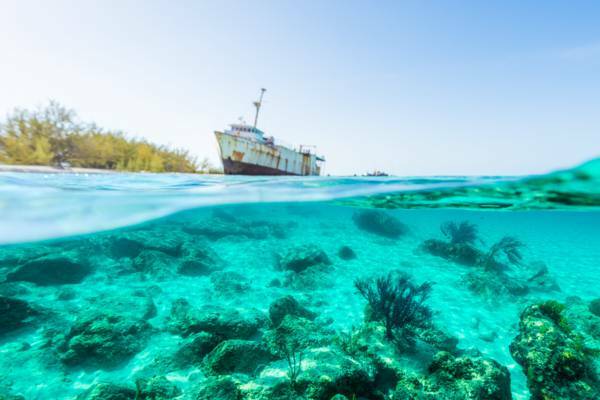 Small amounts of coral, a few red sea fans and some tiny reef fish can be seen here, but this site really doesn’t compare to the incredible snorkelling reefs found at other locations in the Turks and Caicos. Apart from this small collection of rocks, the ocean at Governor’s Beach offers a beautiful white sandy bottom. Although only about 1 mile (1.6 kilometres) north of the Grand Turk Cruise Center, it’s unfortunately not possible to walk up to Governor’s Beach along the coast as the main port for Grand Turk blocks a small section of the way. Some may consider walking the 1 mile (1.6 kilometres) each way journey along the road, but be aware that there are no sidewalks and few directional signs. A snorkel and swim package offered through the Cruise Center includes transport to and from Governor’s Beach, a bottle of water and the use of snorkel gear (equipment used by countless guests). Rates are $29.99 per person. A taxi should cost about $4 (2017) per person each way to and from the Cruise Center. There is ample free parking if you have a rental vehicle. The beach fronting the Cruise Center gradually improves as it progresses towards Governor’s Beach, so if you’d rather not arrange transport, consider simply walking down the coast a distance. Doing so will also offer the benefit of a less crowded coast. The Mega One Triton shipwreck on Governor's Beach. It’s impossible to not notice the large grounded ship at Governor's Beach. This vessel, the Mega One Triton, was washed ashore during Hurricane Sandy in 2012. 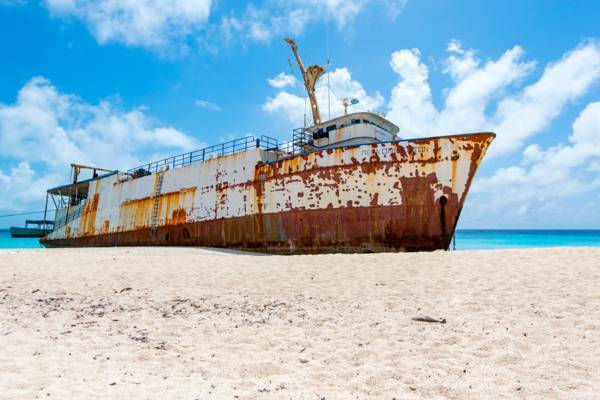 Formerly an oil rig service vessel, after it was decommissioned it started a new life as a cargo ship with a route between the Dominican Republic and Grand Turk. Attempts have been made to remove the vessel, but due to its size and budget constraints efforts continue to be unsuccessful. Main access and parking area for Governor's Beach. Last reviewed by an editor on 12 October 2018.